The Purva-MImarhsa sutras of Jaimini can be said to give a synthetic view of the science of rituals as propounded in the Karmakanda portion of the Veda. 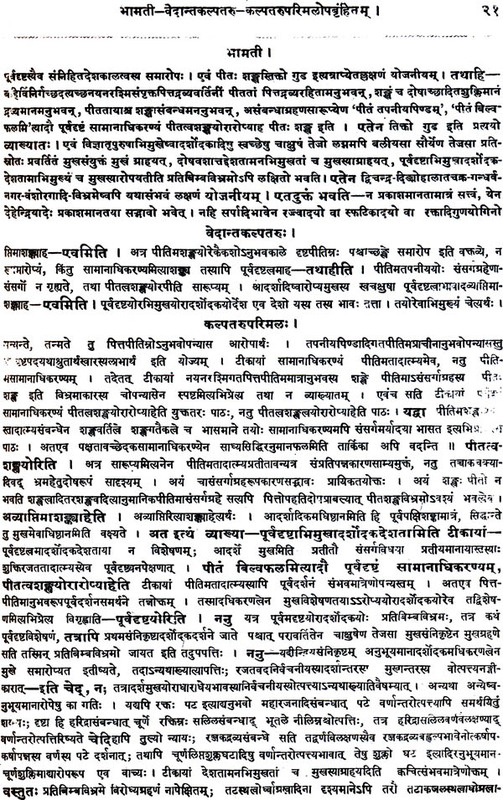 The Brahma-sutra or the Uttara-MImamsa-sutra of Badarayana does the same in connection with the teaching of the Jnana-Kanda portion, or the Upanisads. In the sutra form of literature, the sutra is expected to be as concise as possible and yet to be packed with meaning which is in-exhaustible. The sutras are like very brief notes of topics taught by a teacher, that have been taken down by the pupil. As Sankaracarya says, the Brahma-sutras string together the Vedanta texts like flowers Rational thought helps to bring out the true meaning of the Vedic texts, which are the sole pramana for the knowledge of the Ultimate Reality. Philosophers trying to understand truth and the means to discover it with the help of reason and its dialectic, reach a position of some sort of agnosticism and/or scepticism. But very few philosophers have remained satified with this. Either they have felt a need for some positive stand on which they could base their thinking and search for truth, or have perceived in their psyche some sort of perceptive power which could lead them to something positive. This may be called intuition or darsana. And some have even recognised something positive on the strength of the will to accept, that is to say, faith Kant, for instance, recognised God not on the strength of his critical reasoning, but on that of faith or his inner conviction. That is why he is accused of expelling God from the front door and bringing him back by the back door. Our thinkers, similarly, say that the Ultimate Reality (whatever name be given to it) which is anirvacaniya, inaccessible to the senses, speech and reason, can be realised by the intuitive vision (prajna, anubhava) alone. The Indian thinkers in the main recognised this as one of the fundamental sources of knowledge and therefore they found a place for this source of knowledge in their scheme of pramanas along with sensuous empirical experience and the reasoning based on it. Indian logic and epistemology do not end merely with empirical experience and inference based on it. In the western systems of thought this type of knowledge has been excluded from logic and put into the category of revelation which is supposed to be the source of religious truth. In the scheme of thought of the ancient thinkers of India, both these aspects of the human mind were somehow kept together even when the philosophers were aware of the difference between these two types of experience and knowledge. The justification for finding a place for agama of sabda pramana lies in this inasmuch as the scriptures are believed to be expressions of such intuitive experience, and therefore empirical experience and reasoned out inference are viewed consistently with it. This helps one to understand why the Vedantins attach the utmost importance to the authority of the Sruti and regard reasoning as subservient to it. The Brahma-sutra of Badarayana has four chapters (adhyayas), and each of these addyayas is divided into four padas, Each pada is divided into adhikaranas (sections) comprised of sutras, varying in number. The number of sutras in each adhikarana depends on the nature of the topic (-highly controversial or not so complicated-) dealt with in that adhikarana. 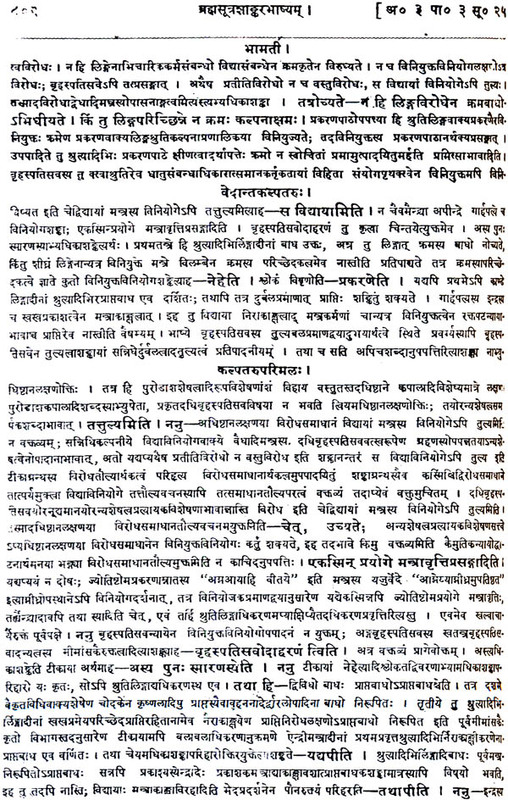 Each adhikarana, according to the commentators, takes up for consideration a visaya-vakya (Vedic sentence serving as a source for the philosophical topic under consideration). This commentary gives a reasoned account of the topic or subject-matter, the doubt or controversy centring about it, the prima-facie view, the conclusion aimed at and its consistency. 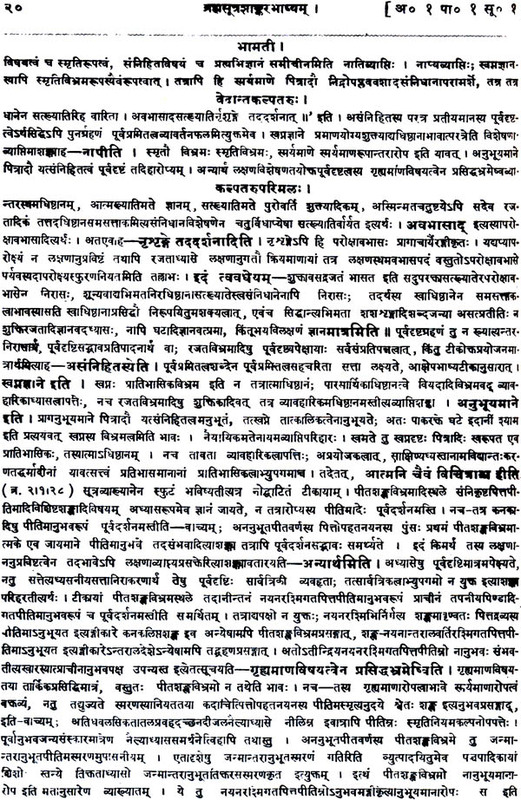 The first chapter of the Brahma-sutra is known as Samanvayadhyaya inasmuch as it offers a coherent interpretation of the different texts of the Upanisads (which are liable to be interpreted differently) and drives at the conclusion that Brahman is the purport of the Upanisads and that words like Anandamaya, Akasa, etc. if they are employed as referring to the ultimate cause of the world, can mean just Brahman, and so there is no inconsistency in the Upanisadic teachings. Even before the Sutra Period, different interpretations of the Upanisadic passages had cropped up and it was left to the Brahma-sutra to evolve a systematic account of the Upanisadic teaching propounding Brahman as the Ultimate Reality and as the ultimate cause of the phenomenal world. The second chapter is known as Avirodhadhyaya as it shows that the above-mentioned conclusion is not in conflict with the writings of other sages who follow the Veda and base their teachings on it. There is an attempt to refute the views of rival schools of thought and also to show that there is no inner contradiction in the teachings of the Upanisads. 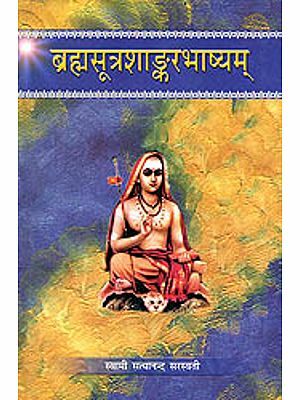 The third chapter known as Sadhanadhyaya is devoted to the exposition of the means of the realisation of Brahman or the attainment of emancipation. The fourth chapter known as Phaladhyaya deals with the effect of the attainment of true knowledge on papa and punya, and the fruit of knowledge as such. There are some slight variations in the readings of the sutras of the Brahma-sutra. Further, sometimes one sutra is read as two sutras or vice-versa. Sometimes the last word of a sutra is added in the beginning of the next one. Such variations lead to divergent conclusions. Commenting on IV. 3. 7-14, Sankaracarya says that following the usual pattern of treatment in adhikaranas, some regard sutras 7-11 as stating the purvapaksa or the opponent's view and 12-14 as setting forth the siddhanta, the final view, whereas according to Sarikara, sutras 7-11 set forth the final view and sutras 12-14 state the purva-paksa which is given as what was meant to be refuted. Thus from very early times, the sutras lent themselves for varied interpretations, Since the sutras thus admit of different interpretations, the commentator could honestly admit their validity and basic support and still pursue his own independent line of reflection. Badarayana himself has referred to diverse views of Acaryas (like Asmarathya, Audulomi, Kasakrtsna and others) in connection with some philosophical points such as the relation of the individual soul and the Highest Self and so on. These theories have received manifold expression amongst the commentators of the Brahma-sutra. Bhartrprapanca, Bhaskara, Yadavaprakasa, Ramanuja, Nimbarka, Vallabha, to mention a few of them, believe in the reality of the universe as well as its divine origin, in the distinctiveness of the individual souls, in whom the divine is mainfested; different importance is attached by them to the value of action, knowledge and love, and devotion and service as the means to the fulfilment of life. Sarikaracarya has attempted to build a spiritual view of life on the basis of Reason. He syas that one who adopts just any view without full inquiry will miss his aim of beatitude and meet with disaster. He tries to show that the Upanisadic passages could be properly interpreted on the lines of Absolute Non-dualism (Kevaladvaita). Sankara has propounded his philosophy from two points of view-the higher or the supra-empirical, and the lower or the empirical. From the higher point of view, Sankara is an Absolutist. Brahman is the only Reality, everything else being unreal. This Brahman is attributeless (nirguna and eternally unchanging (kutastha). 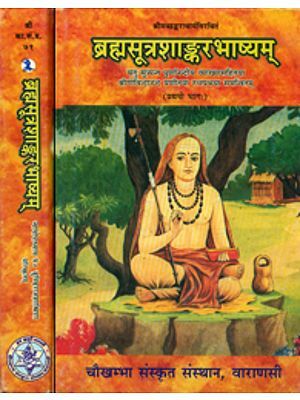 The doctrine of nirguna Brahman is, in a sense, as old as the Upanisads, but we come across the philosophical and dialectical development of the concept for the first time in Sankara (-though his indebtedness to his grand-preceptor Gaudapada should not be lost sight of). The Upanisads and the Brahma-sutra were interpreted even before Sankara on the lines of some type of bhedabheda, unity in diversity-Brahman and the soul or the material world were regarded as both identical and different. Sankara firmly believes that bheda (difference) and abheda (non-difference) being mutually contradictory cannot be predicated of the self-same things. Moreover, this view does not solve the problem of causality. It makes the nature of the thing self-contradictory and this points to falsity. Sankara admits that there are noticed at times two streams of thought in the Upanisads; but, in his view, one of them is only a concession to the empirical modes of thought (apara vidya) (See Br. Su. 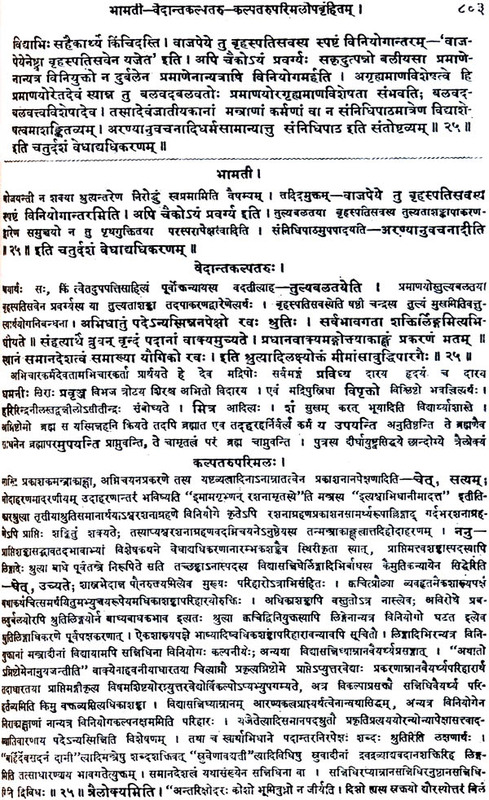 Sarikara-Bhasya 1.2.21; II.1.14, etc.). The only teaching of the Upanisads is, according to him, that of Absolute Non-dualism (Kevaladvaita). He regards the diversity as falsely superimposed on the non-dual Brahman by virture of Avidya. The Sarhkhya recognises that there is a material element besides the spiritual elements in the universe; but it fails to satisfactorily explain the relation between spirit and matter. Sankara denies that there could be any relation between such distinct entities as spirit and matter; and yet our experience tells us that they are not only related but also identified, as when we say 'I am lean' and so on, where leanness is a characteristic of the physical body and yet is predicated of the spiritual self. The only way out of this difficulty is to regard the relation between them as ultimately false. A necessary corollary to this is that one of the things related is unreal. Sankara takes it for granted that matter is unreal as the other alternative would result in Materialism (see Adhyasa-Bhasya). Therefore, the objective world is an appearance. As a serpent is superimposed on the rope, so is the pehnomenal world superimposed on Brahman. The jivas (individual souls) and Isvara (Creator God) also are unreal in the sense that yellow conch-shell or red crystal is unreal; As the white conch-shell is due to some defect of the eye cognised as yellow, or as crystal appears as red on account of the red flower on which it is placed, so is Brahman looked upon as jiva or Isvara because of the conditioning by Avidya. From the ultimate point of view, Brahman alone exists, unmodified, undifferentiated, removed from the slightest trace of limitation or conditioning as there is nothing else which could bring this about. This is the Absolutist view of Sahkaracarya.